In this project the interior was designed to instantly attract the attention of the people to a new place. Thus, an expressional dynamic design created by Archi-cubes, was meant to become one of the client attraction factors, a kind of competitive edge of the Heritage Luxury Suits.As a basis there was a rather small and simple space. We wanted to save this simplicity and make the main emphasis on a really unusual, memorable structure. 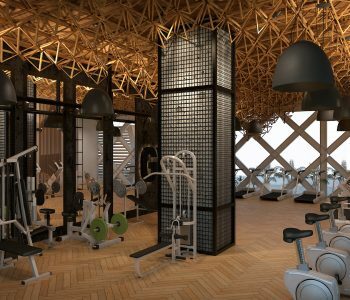 Thus, an impressive wooden construction was created, consisting of more than 400 volumetric triangles. 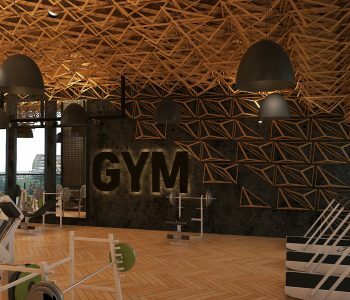 Moving from the wall to the ceiling resembling a wave, it envelops the entire main hall of the gymnasium and creates a shell of the space. The structure of triangles just became such an element, it is also reminiscent of classical Asian wooden building constructions and Japanese geometric ornaments. The rest of the interior is muted in fact to a minimalistic background. 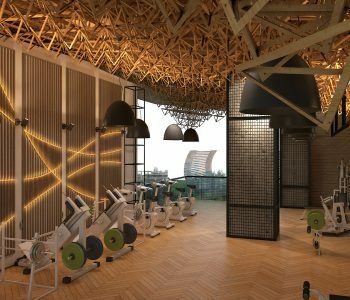 The grey tones of the walls and the wooden floor of herringbone texture, allow the design to play a major role and the white accents of gymnasium equipment add elegance to the overall interior. Architecturally exposed steel structure, when left exposed, structural steel can express form, integrity and beauty in buildings while simultaneously demonstrating function and strength. Architecturally exposed steel structure can express the structural integrity in a striking way and put the structural system at the aesthetic forefront. The crisscrossing metal beams surrounded the top fourth floor of the building creates a white lattice exterior. The ceiling of this room subtly undulates to create natural drainage slopes on the glass covered roof above. The wide glass windows behind the steel structure provides natural light throughout the day.In the color palette, warm and light shades enhance energy and promote relaxation. This project was designed by Archi-cubes, an Architecture Firm, having the Best Architects in Lahore. From its planning to its execution everything was done by a team of Architects and an Interior Designer. We give a touch of elegance to each project with sophistication and proper price.